1930 Airmail-letter to Paris, with Mi.287, 327, CDS Serv. Aeropostal Buenos Aires/ 26.DIC 30., on reverse dirty, air stmp part. over margin, to examination. 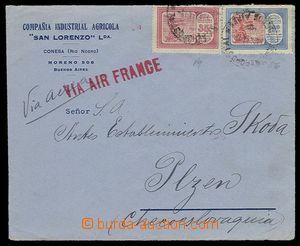 1934 air-mail letter to Plzen, with Mi.321, 330, straight line postmark VIA AIR FRANCE + worse CDS Serv. 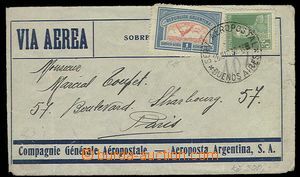 Aeropostal Buenos Aires 1.AGO 34., on reverse arrival postmark. Prague 7 Abroad/ 14.VIII.34, good condition. 1880 postal stationery cover with additional-printed black stamp. 200Reis, CDS Santa Cruz 7.Maio 80, addressed to to Bohemia, on reverse 3x transit pmk Rio de Janeiro, Rio Grande du Sul., Porto Alegme and arrival Gablonz 20/7. good condition only several stains. 1900 picture letter-card (Casa da Moeda) with printed stmp 200 R yellow, uprated with stamp Mi.145, CDS Rio de Janeiro 24/Out 1900, addressed to to Argentina. Without margins only on/for L side. Nepoškozeno. 1931 Reg letter to Czechoslovakia, with Mi.4x 340, 2x 360, CDS Rio de Janeiro 6.X.31. good condition. 1929 air-mail letter transported the first flight Toronto - Kingston, 4.6.1929, with Mi.127, cachet + PSR Toronto JUN 4, 1929, on reverse arrival postmark. PSR Kingston JUN.4.1929 (industrial exhibition), good condition. 1946 USA 2 pieces of oblong postal stationary covers send registered by air to Czechoslovakia, added definitive stamps, i. a. 1$ stamp Mi.439, daily postmark New York, Jan. and Jul. 46, 1x with box frame hand stamp of customs control. 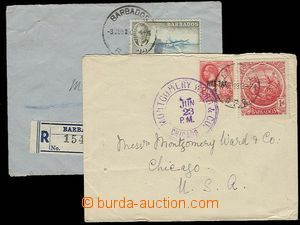 1919-36 4 pcs of postal stationery covers 2c, 1x clear with pre-printed daresou, 2x uprated and to Europe. good condition. 1965-66 field post soldier on a mission in Vietnam, 3 pcs of envelopes with cancel. Army&Air Force Postal Service, addressed to through/over centre in/at San Francisku. Without damage. 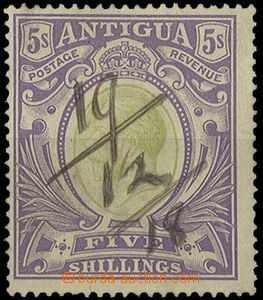 1860-1900 selection of 30 pcs of fiscal stamp. US. Inter. Revenue, values 1c to 2USD. Major part good quality.